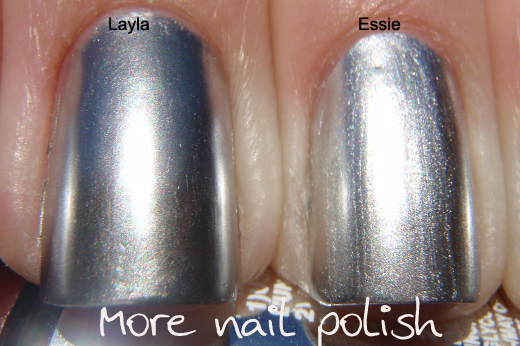 Last weekend, after I received the Essie Mirror Metallics, I did some quick comparisons next to the Layla Mirror Effects. I absolutely love the Essie Mirror Metallic polishes, mainly because they did a great job with the colour range (especially as there are only five colours) I really wish the Layla Chromes had some gold shades like Good as Gold and Penny Talk. After seeing swatches, I was pretty sure that the Essie polishes wouldn't be as mirror like as the Layla ones. Lets have a look shall we. As you can see, they Layla mirror polish really does dry with barely any brush marks, whereas they are still noticable on the Essie polish. 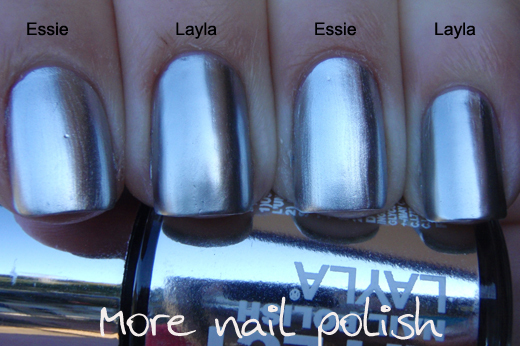 In these photos the Essie looks lighter, but its only because it has a frostier finish and is reflecting more light. But, saying that - in shaded light it's acutally much harder to tell the difference. You can just see a slight fuzziness along the shadow lines with the Essie. But, if you aren't able to get Layla polishes, then the Essies are a great alternative. Aussies should note that I have now seen the Layla Mirror Effects in Price Attack. But they were $20 a bottle. Next up, I wanted to test out some different base coats for the Layla polish. The three options I chose were Nfu Oh Aqua base, Seche Vite top coat as a base and NailTek II Foundation. 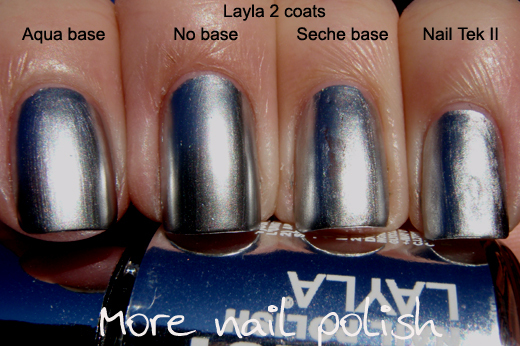 I compared those three bases against how Layla recommends you wear the polish. That is, with no base coat and using a buffer to buff out any ridges and make your nail nice and shiny (which I have actually done on all my nails). Using Aqua base (shown on the index finger) the Layla mirror effect polish applied perfectly, no balding or streaking. However it did dull the finish somewhat when compared to the nail with no base. Using Seche Vite top coat as a base was pretty much a fail for me. I usually paint my nails with a wipe down the centre of the nail, then one on each side. But as soon as I wiped on each side, where it touched the centre part that was already painted, it dragged it all off. Using NailTek II Foundation, the application was horrible, streaky and still retained the matte finish of the base coat. Yuk. 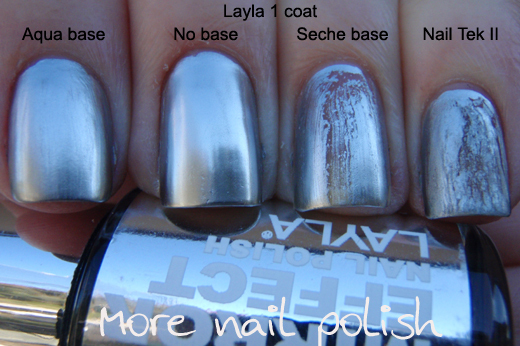 The below photo shows one coat of Layla Metal Chrome over each base. Here is two coats of Layla Metal Chrome over each base, this time shown in the sun. Verdicts. For the Layla Mirror Effects - If you have an Aqua base and are ok with the slight dulling effect, then use that. If you want to see the full effect of the polish, get buffing and expect only one day's wear out of the polish cause it just flakes and falls of pretty quickly. Avoid Seche Vite top coat as the base - it didn't work very well in my experience. Stay away from your NailTek II. OR try the Essie Mirror Metallics, they are pretty close if you can handle the brush marks, their colour ranges is better, and from my experience, they last longer on the nail. I used SV as a base for one of the mirror effects and I found application to be pretty good. Except that a few hours later (much to my late-night entertainment), it started peelng off in sheets! I wonder how it would apply over ridge-filling bases or over sticky ones (like Orly Bonder and INM Milky base)! Great comparison! I have Maybelline Mirror Image, and I think it's pretty close to the Layla in terms of lack of brush strokes & shine. I used a base coat (sally hansen nail thickener) and cult nails wicked fast over Layla Mirror Effect - Metallic chrome and I didn't experience any dulling! lol it's so weird how people can own the same polish but experience different things with it. Ooh great info! I tried mine w/ Aqua Base and thought it was kind of dull... now I know I wasn't imagining things! TY! Each time I see Layla's chromes I gasp at their beauty... and then I read how high-maintenance they are. Again and again and again.